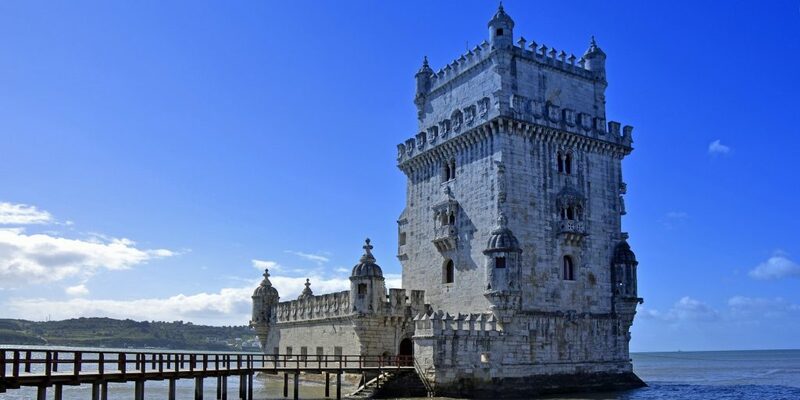 BELEM TOWER - History - Art and Architecture - Online Tickets. The Belém Tower is located in the city of Lisbon, Portugal in the south of Europe. 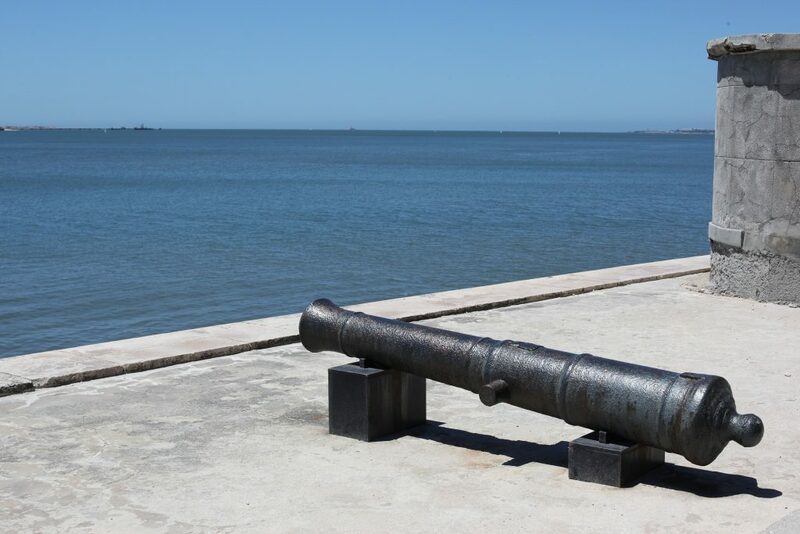 This monument was erected for the purpose of serving both as a gateway to the city of Lisbon and as a defense against possible invasions and attacks from the Tagus. This rampart was a strategic point also protecting the Jeronimos Monastery, which constituted strategic points to invade the city. King John II of Portugal (1455-1495) was at the origin of this building, as were the fortresses of Cascais and São Sebastião da Caparica. The shores of Belém were once protected by a vessel, the Grande Nau. 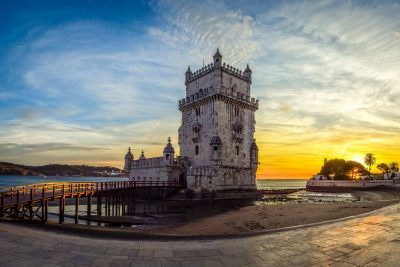 It was replaced by the Belém Tower a few years later during the last five years of the reign of King Manuel I of Portugal. The tower was built between the years 1515 and 1521 by the military architect Francisco de Arruda, who was already the designer of several fortresses raised in Morocco, on lands owned by the Portuguese. The influence of Moorish art is evident in the delicate decorations of curved windows and balconies, as well as on the fluted cupolas of the watchtowers. It is likely that Diogo de Boitaca, the first architect of the Jerónimos Monastery, also participated in the decoration of the building. The machicolations and the battlements are decorated by rich sculptural ornaments, typical of the Manueline style. In 1580, when Lisbon was invaded by Spanish troops for the struggle of the Portuguese throne, the tower was ceded to the Duke of Alva, Ferdinand Alvare of Toledo. During the following centuries, the tower was mainly used as a prison whose underground cells were regularly flooded. Because of its height and lack of concealment in the landscape, some historians believe that the tower should serve primarily outpost. The tower, built on a small island near the banks of the Tagus River, has seen the north shore gradually move closer with time. 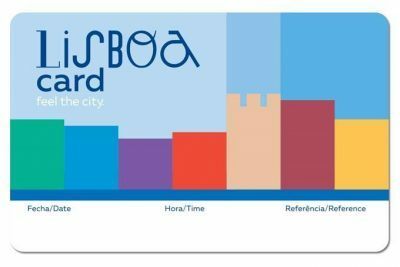 Some guides say that the tower was in the center of the Tagus and that the 1755 earthquake would have changed its course, bringing the tower closer to the shore – this version has never been confirmed. 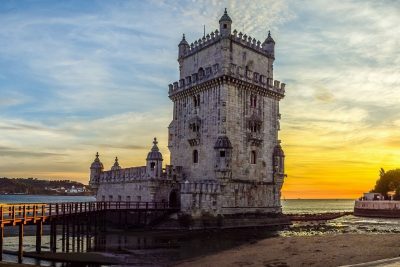 In the 1840s, under the impulse of writer Almeida Garrett, the tower of Belém was restored by King Ferdinand II of Portugal. At the same time, neo-manual ornaments were added to the building. The building was declared a national monument in 1910. 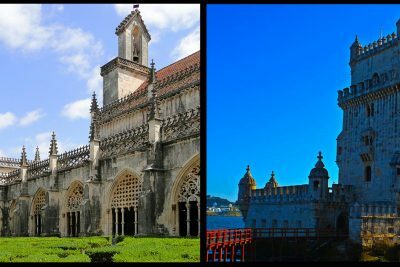 The Belém tower is considered to be one of the major works of the Manueline style, thanks to its many typical motifs such as the armillary sphere (symbol of Manuel I), the cross of the order of Christ (to which Manuel I belonged) or elaborate warheads. However, certain ornaments of the tower date from its restoration, in the middle of the nineteenth century, such as the shields bearing the cross of the military order of Christ, decorating the battlements as well as the small cloister. The most elaborate decorations face the Tagus. 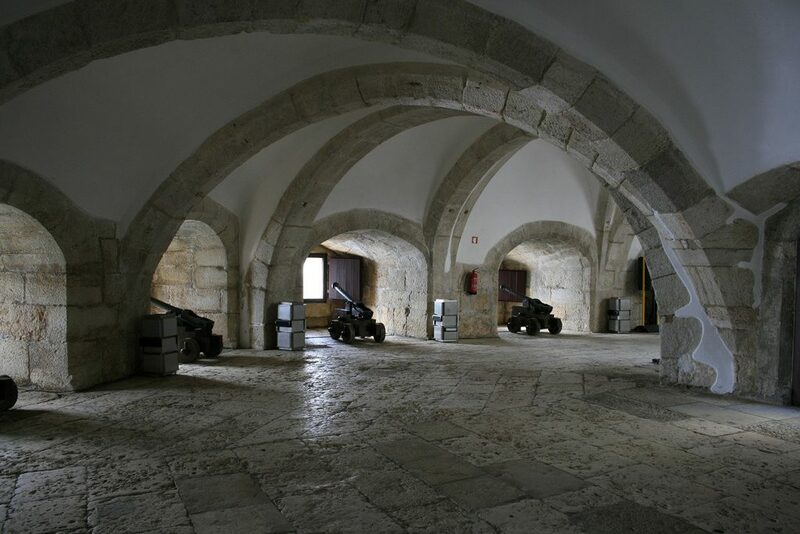 The bastion presents a vaulted room, the casemate, with openings in the walls of 3,5m thick for the 17 large-bore bolts. 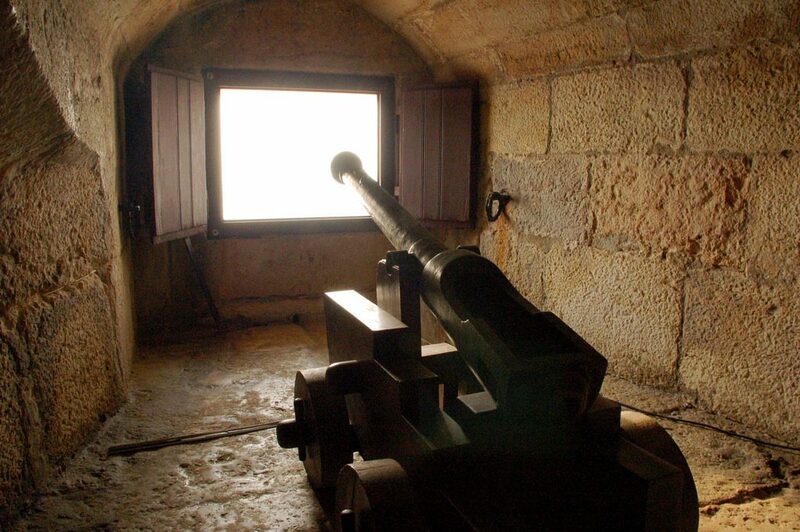 The open roof in the center of the casemate facilitated the dispersion of fumes generated by the use of these guns. The bastion platform could also serve as a stance for smaller weapons. The Belém Tower was the first Portuguese fortification with two floors of firing positions, marking a new evolution of military architecture. The corners of this platform, as well as the top of the tower, are equipped with turrets surmounted by domes reminiscent of Moorish art. The base of the watchtowers features images of wild animals, including a rhinoceros which is considered the first sculpture of this animal in the art of Western Europe. This rhinoceros was probably one of those that Manuel I sent to the pope in 1515. 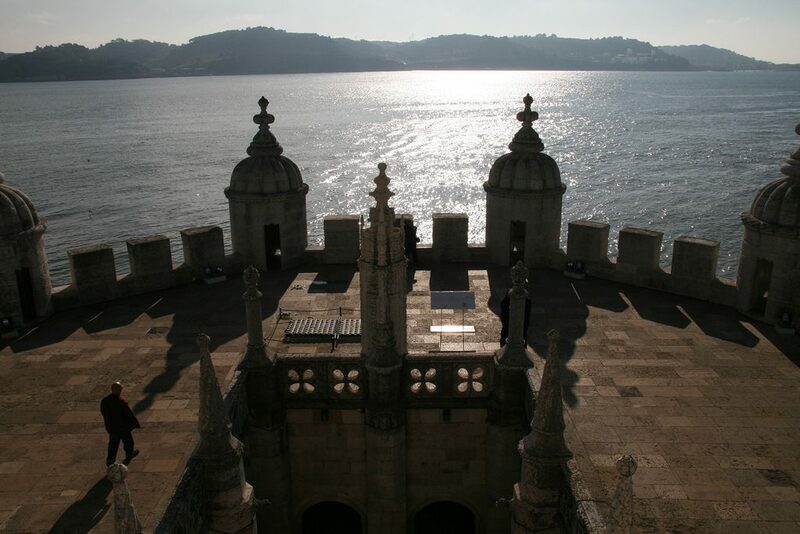 The platform also includes, facing the tower, a statue of the Madonna and Child of Belém. The entrance to the tower is through a porch decorated with several Manuelin motifs, including the armillary sphere. The entire tower is decorated with twisted cords carved in stone, which even form a knot on the north facade of the building. The tower is surmounted by statues of St. Vincent and St. Michael archangel, and is provided with several arched windows. The covered Renaissance style loggia runs along the entire south side of the first floor of the tower, giving a Venetian touch to the building’s architecture. The many shields decorating the merlons are of neo-Manueline style. The tower, 35 meters high, has three floors and a terrace offering a view of the surrounding landscape. Gunpowder was kept at sea level. Access to the upper floors is via a spiral staircase. The captain’s apartments were on the first floor, and a chapel, whose decoration took up the cross of the order of Christ and the armillary sphere, occupied the fourth floor.